The Grand Canyon viewed from the South Rim. The exposed section ranges from Paleoproterozoic basement in the inner gorge to Permian limestone atop the rim. See manuscript on page 354. This paper describes a student exercise in mapping, designed to highlight the fact that maps within the field of Earth Sciences (geological, geophysical etc) are most often made from sparsely and spatially non-uniformly distributed data implying that the final products depend both on sampling strategies and interpretation. The pedagogic, take-home lesson from our exercise is that no map is better than the input data and no map represents the absolute truth. To convey this, individual students, or students divided into groups, are provided with data points derived using different sampling strategies over one defined area. From this set of data samples, the students have to interpret and produce maps, which are then compared. None of the maps created by the students will be identical, which will clearly demonstrate the main point of the exercise, i.e. no map represents the absolute truth, and stimulate a critical view of published maps in Earth Sciences. We present the details of a qualitative chemistry exercise that can be used for mineral identification and requires relatively simplistic laboratory facilities. The exercise is used as part of a forensic earth science module for second year BSc Forensic Science students who previously have had a basic chemical education but little experience of classical inorganic analysis. We suggest that it could be adapted for use with students studying beginning geoscience courses who could usefully increase their knowledge of chemistry. Flow charts that guide the students through the investigation are provided. For more experienced students, references are provided that illustrate more advanced "wet" analytical techniques. Nine 11th and 12th grade students from a large urban high school participated in a three-tiered program that charged them with the responsibility to be earth science mentors for 7th graders from a local feeder school. During Tier I, a three-month training period, these 11th and 12th graders worked closely with university-based scientists, science educators, and secondary science teachers to learn a tested curriculum on climate change and to prepare to be mentors. Prior to Tier I, four scientists involved in climate change research were asked to derive independently a list of concepts that they perceived to be most central to this topic. A concept mapping exercise was developed from their consensus and, both at the beginning and at the end of Tier I, student understandings were analyzed with concept maps and interviews. A baseline of 11th and 12th grade students' understandings of climate change is established and suggestions are made as to how these findings can inform instructional practices in the geosciences. Contour maps that depict groundwater levels (e.g.,water table maps and potentiometric surface maps) are essential to the practice of hydrogeology. However, there are significant barriers to effectively teaching students how to create and interpret such maps. Barriers to instruction include the logistics of accessing real wells, assuring that students are provided with a challenging problem, and the lack of a unique solution. We present a new approach that overcomes these barriers through the use of artificial wells and synthetic data. Our approach provides students with a challenging problem that takes them through the whole process, from data collection to interpretation of the resulting maps. In the end, students are able to see how their efforts compare to a known solution, rather than another estimate. Students are also able to choose locations for additional wells that they believe will enhance their ability to create an accurate map. These qualities lead to a substantial improvement in student comprehension over instructional approaches that are based on existing data or limited field measurements. 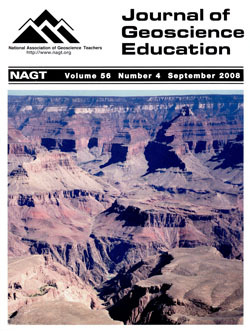 In this paper, we provide both a step-by-step description of how to build an apparatus for investigating extensional and contractional faulting and we provide lab procedures that teachers at both university and high-school levels can use to enhance students knowledge of the fundamentals of faulting mechanisms.The experiments are based on the analog modeling principle, where large geologic processes (both in terms of time and space) are scaled down to be observed in real time within a classroom. The technique is relatively simple, low-cost and reproducible in a short time span. The experiments offer students both a hands-on experience that is a proxy for more complicated laboratory techniques used by researchers and the opportunity for students to see faults grow before their very eyes. We followed this approach with student groups at different training levels (university and high-school) and found that the experiments boost understanding of the processes of faulting. We highly encourage university level teachers to use this technique both within their own curriculum and within programs that transfer knowledge of geologic concepts to high school teachers and students. The MovieClassroom website allows student or faculty users to create and share Geoscience themed digital videos. Movie production can promote learning by encouraging meta-cognition and the synthesis of multiple concepts in an engaging, project-based exercise, with the ancillary benefit of producing educational media useful for peer-learning. The website was tested by students in an introductory Earth Science class (Weather and Climate) who created extra-credit movies designed to be shown to future students. Results of student self-assessments indicate that the website is easy to use and that students took exceptional pride in producing a creative product that could be shared with others. Almost all of the students' movies were scientifically accurate. The website interface and database are currently being upgraded to enable viewer ratings and to facilitate the adaptation of published movies. These changes are designed to allow quantitative assessments of student learning through movie production, and explore the reciprocal hypothesis that student produced digital movies may be an effective means of introducing geoscience concepts to social and cultural peers. The MovieClassroom is an open-source project, therefore details regarding the website design, pedagogy, applications and assessments together with forums for discussion and suggestions are all available. The Trail of Time exhibition under construction at Grand Canyon National Park is the world's largest geoscience exhibition at one of the world's grandest geologic landscapes. It is a 2-km-long interpretive walking timeline trail that leverages Grand Canyon vistas and rocks to guide visitors to ponder, explore, and understand the magnitude of geologic time and the stories encoded by Grand Canyon rock layers and landscapes. As one of a new generation of geoscience education exhibits, the Trail of Time targets multiple cognitive and affective levels with accurate content, active geoscience inquiry and interpretation, and place-based cultural integration. It developed as an outgrowth of sustained geoscience research funded by the National Science Foundation, with scientists as the conceivers and coordinators of the project. It benefits from a high level of synergy with the National Park Service interpretation division, as well as extensive on-site and off-site evaluation of pedagogic effectiveness in the outdoor informal science environment. The Trail of Time will impact many of the five million annual visitors to the National Park. Associated cognitive research on public understanding of "deep time" offers opportunities to inform more effective geoscience pedagogy for informal and formal educational settings. The Earth's Record of Climate is an introductory geology course offered at the University of St. Thomas that explores the science of paleoclimatology and its relevance to the climate change of the last century. Most undergraduate students that enroll in the course believe that climate change is a significant concern, but lack knowledge of the scientific basis or express important misconceptions about the problem. Students build the necessary skills to work with different forms of earth science data including oxygen isotopic data, fossils, and sediment descriptions. They also read and respond to articles on climate change. Students demonstrate their learning with: 1) a final project in which they complete a detailed paleoclimate reconstruction 2) a final exam essay in which they respond in a substantive fashion to a climate change skeptic, and 3) the results of a Knowledge Survey. Knowledge Survey results show a significant increase (1.17 points on a 3 pt scale) in student confidence by the end of the course. Representative comments from student reports on teaching suggest that it both challenges them and increases their interest in earth science. Numerical ratings from student reports on teaching are consistently higher (by 5% on average) than those for an introductory physical geology course that I teach.